Chinese classical furniture is esteemed throughout the world for its beauty, functionalism, and influence on contemporary design aesthetics. Sarah Handler's stunningly illustrated volume traces Chinese hardwood furniture from its earliest origins in the Shang dynasty (c. 1500 to c. 1050 B.C.) to the present. She offers a fascinating and poetic view of Chinese furniture as functional sculpture, a fine art alongside the other Chinese arts of calligraphy, architecture, painting, and literature. 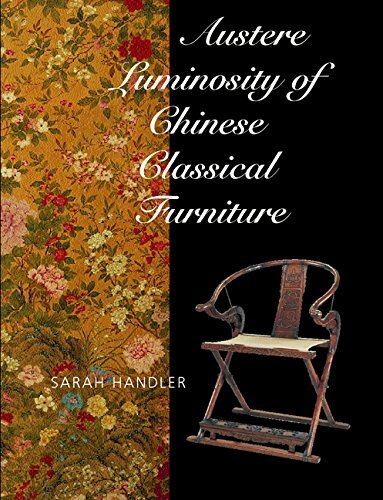 Handler, a widely respected scholar of Chinese furniture, uses her knowledge of Chinese social, political, and economic history to provide a backdrop for understanding the many nuances of this art form. Drawing on literary and visual evidence from excavated materials, written texts, paintings, prints, and engravings, she discusses how people lived, their notions of hierarchy, and their perceptions of space. Her descriptions of historical developments, such as the shift from mats to chairs, evoke the psychological and sociological ramifications. The invention of a distinctive way to support and contain people and things within the household is one of China's singular contributions, says Handler. With more than three hundred exquisite illustrations, many in color, Handler's comprehensive study reveals "the magical totality of Chinese classical furniture, from its rich surfaces and shrewd proportions down to the austere soul of art that resides in the hardwood interiors." Austere Luminosity recognizes Chinese classical furniture as one of China's premier arts, unique in the furniture traditions of the world.